A good Southerly at last, after several days of strong hot Northerlies which have been bringing down smoke from the terrible bushfires. On the water at about 11:30. There was only one other windsurfer at the beach so I self launched, not to elegantly. The wind seemed a little variable but was OK. Some good runs out and back, but good turns still elude me. I lose speed and haven't yet mastered the art of flicking the board in the opposite direction. I lost my board when getting up to come back in, a fair way out - yikes. No real option but to body drag upwind, so I gave it a good go. 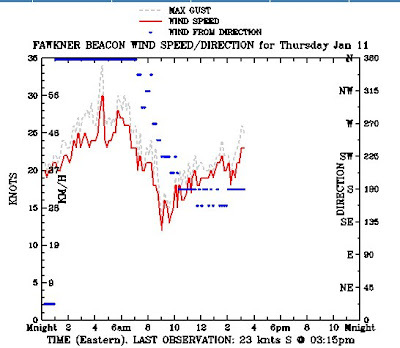 Intially not getting upwind enough - the board stayed just upwind. Then I got the hang of it. 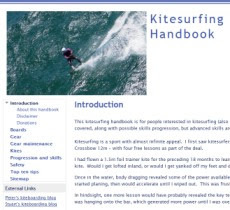 The trick was to keep your windward arm in the water near the surface, like you are about to start a side stroke, then fly the kite upwind and low until you feel pressure on the arm - at which time it is acting like a keel. Don't put your arm deep as it tends to pull you down. I recovered my board, then returned to the beach and walked back a bit. Landing the kite was not too elegant either. Keep hold of the front lines to ensure that there is no power in it, and try to yank it so the leading edge comes down. After a rest I headed out again, with the wind speed increasing. My good side (going left) seemed less good today, but I really got going coming back in (to the right). Concentrating on letting the board plane a bit and gather speed - which I got a lot of - and caught and planed down quite a few bay waves. Great fun. Tired arms due to the bar pressure, so I stopped. One other kiter showed up as I was leaving. I launched is 14m C kite for him - it seemed huge. Great blog. You really should consider hosting your blog on your own space. Wordpress is the way to go for the long haul and I will set it up for you.